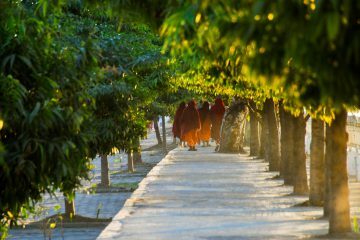 Shwedagon Pagoda, Bagan Temples tour, Sunset in Bagan, Mt.Popa Day tour. We hope you had a smooth flight to Myanmar. On your arrival, you will be warmly welcome by one of our guide/representative with a greeting in local language. And then you will be transferred to your hotel to check in. No vacation is complete if you missed out Shwedagon Pagoda. You can not help admired in its shape and glowing structure. After sunset, you will be taken to a local restaurant for your vegetable dinner. Then, you will return to hotel in the evening and overnight. Enjoy the sunrise in Yangon by Inya lake. Carry out your yoga session. After the lesson, return to hotel and take a break. In the afternoon, transfer to a local restaurant to savour your vegetable lunch. You will first visit to Botataung Pagoda and site existence was dated back to Buddha lifetime, according to the Buddhist literature. Sacred relics of Buddha hairs are believed in the casket well-placed down the depository. After WWII bombing fell on it, the relics are maintained very well and keep them in public visualization. Being one of the largest lying Buddha in Myanmar, Chauk Htet Gyi statue received more fame among the visitors due to its proportionate and finest decoration. 108 sole marks or footprints are not be neglected because you can learn the religion and beliefs of a Buddhist. And then, You will enjoy outing in the downtown of Yangon with your guide and explore the collection of the colonial remains and daily activities on the roads. As you have walked along in the downtown, you will be taken to a restaurant for your dinner. 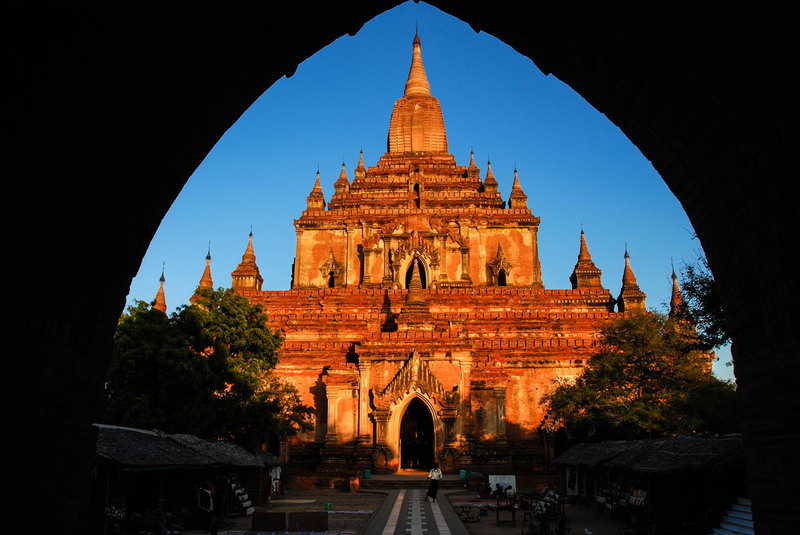 In the afternoon, a selective temples of ancient Bagan will be introduced in your first day excursion. Ananda temple is the most finest architecture in and out of the temple among others in Bagan. After Ananda temple, drive to a local restaurant for your vegetable lunch. Another one of the highest temples in Bagan is Htilominlo temple. Solid, gigantic and well-structured, Dhammayangyi temple is not only the culture or religion matter but the advanced masonry of ancient architects are on sight. Don’t miss off this chance of watching sunset on one of an elevated point as she magically alters her spectrum of colors in the evening sky. You will get astonished all the way the Sun drags all her glowing light over the horizon along with her subsidence to the west and everyone exclaims. Bagan is not just plainly for the marvelous temples, yes also for her wonderful sunset and sunrise. After sunset, you will enjoy your vegetable dinner and return to hotel. Breathing clean and fresh air, you will continue second day Yoga session. Take a break at the hotel and go out for vegetable lunch at a restaurant. In the afternoon, you will proceed to awe-inspiring Mt.Popa. Popa is a mountain over 1500 meter height, which is extinct volcano now. Popa pedestal or rocky protruding and Buddhist monastery and pagoda impossibly build atop on the elevation of 650 meters height. You will enjoy the scenic ride about 1.5 hours along the way to Mt.Popa and you will be completely pleased in watching the scenes of central Myanmar. On arrival, right before you climb up the stairs to the summit, you will be introduced the ancient animism and its deep insight into devotees by seeing a house of Guardian of Mt.Popa. Please take also note that Mt.Popa is also a home of Nats or beliefs of animism. Then, you will get atop the hill and enjoy the 360 panoramic views. 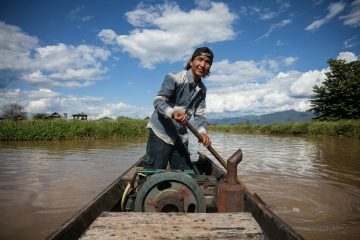 On the way back to Bagan, you shall also halt at the palm villages and where learn the famous traditional palm sugar and palm juice. After that, you will return to Bagan and treated you with a vegetable dinner and overnight in Bagan. After having breakfast at the hotel, you will explore the most vibrant Nyaung U market and splendid Shwezigone Pogada and GuByukkyi temple. And then, you will be transferred to the airport for your onward flight for next destination. On arrival to Yangon airport, you will be taken to hotel and check in. In the afternoon, you will be taken outside for your lunch at a local restaurant. And you will be taken to a house museum which is used to be a home of Gen.Aung San who sacrificed his life for the nation and who was a father of Today The Lady, Aung San Su Kyi. Named after British Municipal Commissioner Gavin Scott and now called Bogyoke Market. It is top shopping center or a collection of Burmese artworks. In the evening, you will be taken for your dinner and return to hotel.